Two charming cottages share this delightful property, offering a vacation retreat with the convenience of home. Stay at Eischens to escape from your routine to the quiet tradition of property owned by the same family for 38 years. Consider both cottages for extended family or larger group of friends. 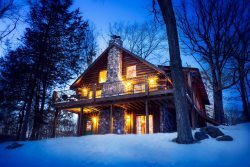 We cant wait to rent this cabin again next year! Always very friendly, professional and helpful. Location is excellent, house is very comfortable and clean. I rented cottage #2 and my brother rented cottage #1, made an awesome Family vacation for both our families. We plan on doing this together yearly. I believe I only spoke with Marci who was very nice and answered all questions. This was our first vacation at the Dells and the location of the rental was very convenient. We have already talking about making this a family tradition. The gentleman that checked us in was fantastic. Explained everything clearly and quickly. Would stay here again and will look into other properties to rent. Your staff is wonderful!!! You go that extra mile to ensure we have all we need to have as much fun as possible. Along with any problems that might arise. The property was perfect!!!!!!! We could not ask for anything more!!!!! The staff was beyond excellent. They were very caring of our needs and went above and beyond to make sure we were comfortable. We stayed on lake Delton. It was beautiful and peaceful. I will definitely be booking a stay with this company again. Everyone was extremely friendly, helpful, efficient and knowledgeable. Eischen #2 was very cozy and nice. Water view was awesome, tv channel choices pretty limited but we brought some dvds and got caught up when we were in cottage later each evening. Area has really more entertainment choices than when we last stayed in Dells area many years ago. We had a great time celebrating our 30th wedding anniversary! Thank you for everything. Your service is fantastic! Keep doing what you are doing! It was a good experience, great price! Had a blast, love the view from the rental!